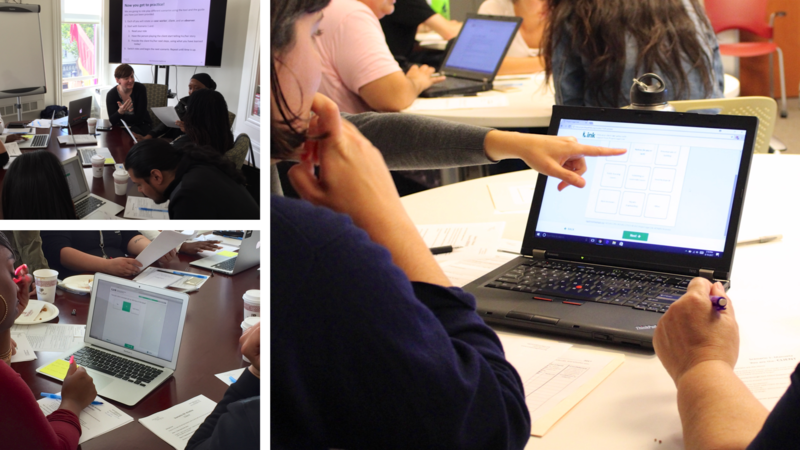 Working with GRID Impact and the Tipping Point Community's TLab to prototype new ways that Project Legal Link connects low-income residents of San Francisco to legal aid services. In California, it's estimated that there is 1 legal aid lawyer for every 8,737 people living in poverty. In the California Bay Area, low-income individuals lack adequate access to civil legal assistance to address life crises that can keep them locked in a cycle of poverty. This is the challenge that Project Legal Link is working to solve. 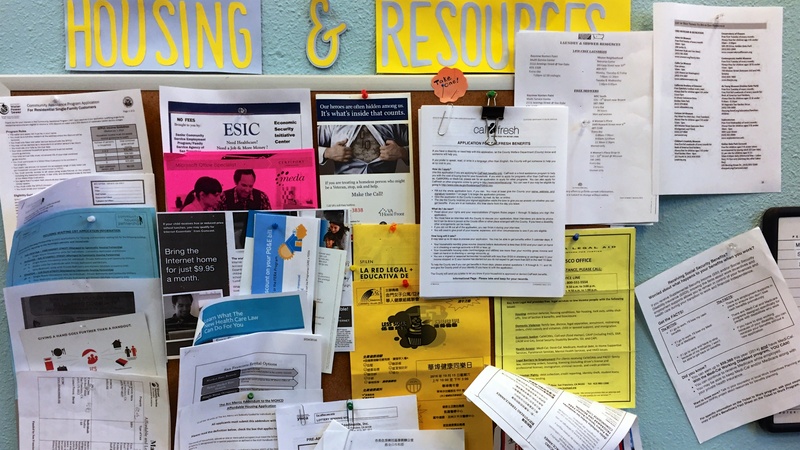 Project Legal Link partners with education, employment, housing and health providers in San Francisco to help those in need access and navigate the legal system. 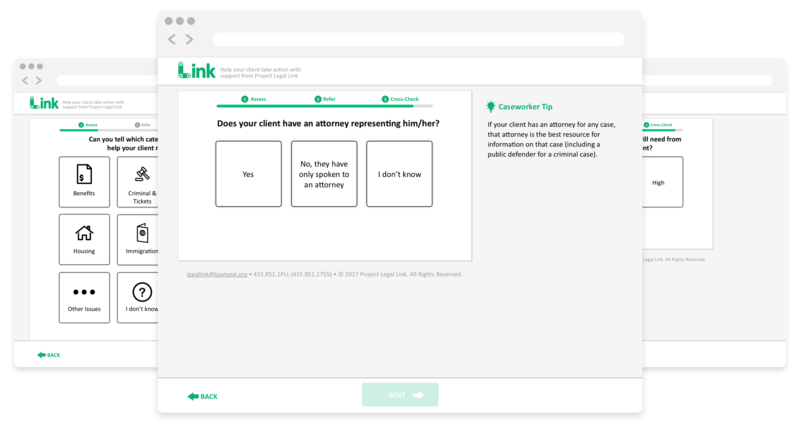 With support from the Tipping Point Community's TLab, GRID Impact was tasked with helping Project Legal Link create a sustainable service model and ensure touchpoints address the most salient behavioral attributes of legal aid lawyers, front-line staff of social service organizations, and their clients. 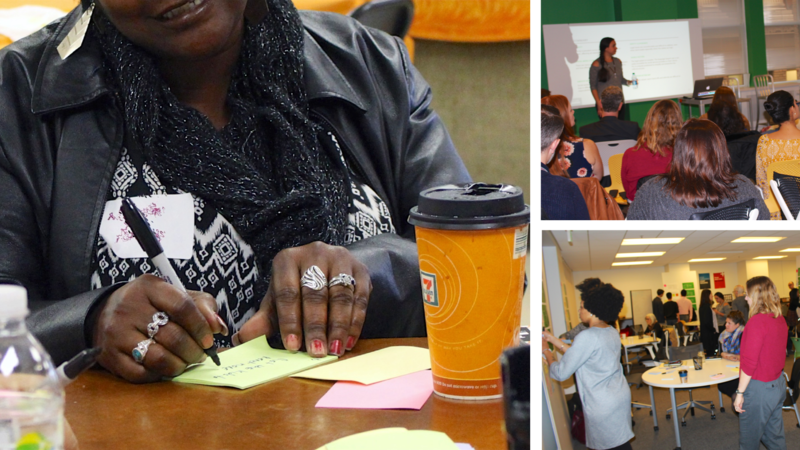 Scenes from the Research Readout and concept ideation which involved 20+ lawyers and social service caseworkers. Using behavioral research tools and participatory design methods, our team led 50+ in-depth interviews to understand the needs, desires, preferences and behaviors of legal aid lawyers, social service providers and their clients. Additionally, we did an audit of 30+ web and paper based resources and observed five PLL Office Hours and Trainings. Scarcity is prevalent across the entire legal aid referral system, affecting all stakeholders in nuanced ways. There are many preconceived notions about the legal system and how effective or supportive it is for low-income clients. Social workers and lawyers fundamentally show up in clients’ lives in different ways due to their training, job responsibilities, personal and daily experiences. Legal issues are uncomfortable and difficult to address, even when (and maybe especially when) the stakes are high. The legal system is complex. The language lawyers use is not easily accessible for social service providers or their clients. PLL is uniquely positioned to simplify and streamline the referral process. Although valued, warm hand-offs and referrals are difficult to scale. We assembled a comprehensive report of insights and opportunities and disseminated it publicly at an event that was attended by legal aid lawyers and case workers from Bay Area social services and legal nonprofits. These stakeholders provided valuable feedback and roughly 20 of them joined us for an ideation workshop to help generate solutions to address the opportunities identified during the research. Photos from the training prototype which introduced caseworkers to the legal referral tool prototype. After generating a breadth of concepts, which ranged from networking platforms connecting social service providers with lawyers to personalized legal action plans for clients, we conducted another round of in-depth interviews and low-fidelity prototyping with 21 lawyers, caseworkers and clients to test the assumptions and hypothesis that emerged from the ideation. We used the insights and feedback from this process to develop a refined service blueprint and identify interventions that would have the biggest impact for Project Legal Link and best allow us to test assumptions about the emerging service model. The first intervention was an updated training module that PLL gives to caseworkers at social service agencies. 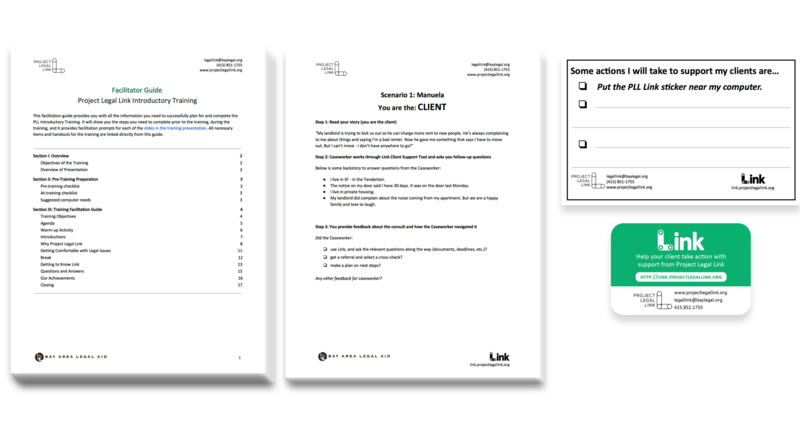 We designed an experience prototype of this training and tested it with 16 caseworkers. The second intervention was a web based tool to help caseworkers find legal referrals for their clients and receive follow-up support from PLL, if needed. We created a high fidelity, interactive prototype and tested it with 9 caseworkers. Materials for the microtrial included a fully functional MVP of the referral tool and materials to facilitate PLL trainings. We partnered with two social service agencies to a run a 3 month micropilot to assess the potential impact of our recommended solutions. It was a quasi-experimental pre/post intervention design with qualitative and quantitative data collection. During this period, caseworkers attended PLL trainings and used the online referral tool with their clients. Data tracking sheets were completed and submitted weekly by caseworkers and Google Analytics was used to track interaction with the referral tool. While there was no increase in the overall number of referrals, there were increases in reported confidence of caseworkers to provide legal referrals following the training using the online tool, a stronger belief that they were better able to do their jobs, and that they were better serving clients. A full analysis and corresponding recommendations were given to TLab and Project Legal Link. This project was a collaboration between GRID Impact, Project Legal Link and TLab. As the lead designer from GRID Impact, I led the concept development and prototype testing. The team from GRID also included two behavioral researchers and a project manager.